Infrared panels are practical, easy to install and can be used in many situations. Infrared heating is a very cost effective heating system, efficiently converting electrical energy into infrared heat. It keeps you nice and warm in the same way the sun works and it doesn’t waste energy and money by heating empty space. Its flexible use makes it possible to heat exactly that area where people are present. All it takes is electricity supply. The panels can be imprinted with high resolution fotos made by a professional photographer or your own. Ask us for the possibilities. Standard the panels are equiped with a nice but simple aluminium frame. This frame can be replaced by more exclusive frames. 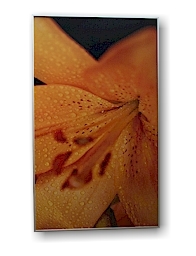 Our infrared panels are a warming artwork.